REP. Gwendolyn Garcia and Provincial Board Member Alex Binghay have asked the court to stop the construction of the P1.3-billion 20-storey building inside the Capitol compound. They filed the injunction suit on the grounds that Cebu Gov. Hilario Davide III did not have the authority from the Provincial Board (PB) to enter into contracts with a bank and a building contractor and ignored other lawful procedures. Named in the injunction suit filed on March 26, Tuesday, at the Regional Trial Court (RTC) in Toledo City were Davide, Vice Gov. Agnes Magpale, Provincial Administrator Mark Tolentino who also heads the Bids and Awards Committee (BAC), contractor WT Construction Inc. and Development Bank of the Philippines (DBP)--the people and entities behind the proposed Cebu Resource Center. Gwen Garcia of One Cebu party and Magpale of Bakud are facing off in the gubernatorial race on May 13. Davide has stepped back to be Magpale’s running mate. He faces off with Daphne Salimbangon, Gwen’s running mate. 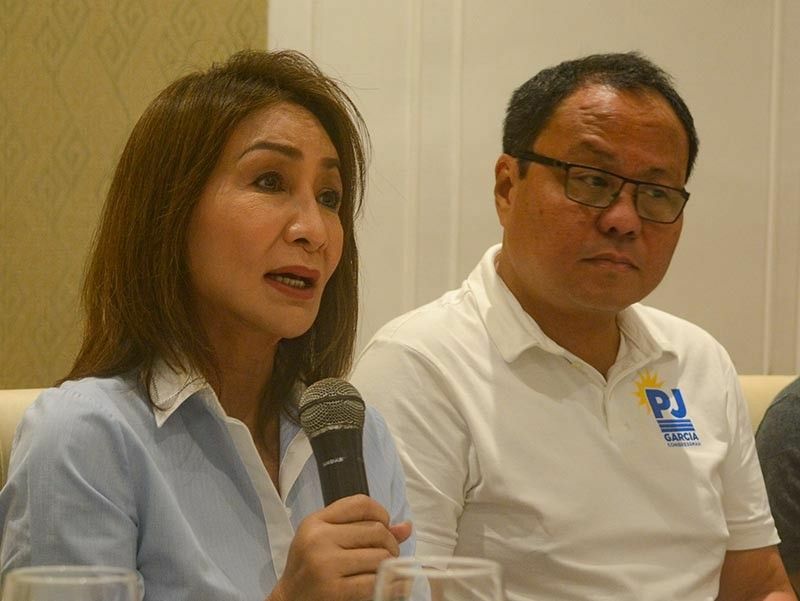 At a press conference Thursday, March 28, in a Chinese restaurant in Cebu City, Gwen Garcia and her lawyers, among them her younger brother Pablo John Garcia, gave details of the violations committed by Davide et al. Davide violated Section 22 of the Local Government Code of 1991 that requires the local chief executive to secure legislative authority before entering into a contract or any agreement with anyone. While it’s true that the PB passed a resolution authorizing the governor to enter into a memorandum of agreement with DBP to take out a loan, there is no resolution that authorized the governor to sign a deed of assignment with holdout, Garcia said. Davide also entered into a contract with WT Construction without PB authority. Tolentino, the provincial administrator, sent a letter to the PB on Jan. 14, 2019 seeking the approval of a resolution authorizing the governor to enter into a contract with the private contractor. Sensing that no authority was forthcoming, Davide had the letter request recalled and said the PB authority was no longer needed based on a Supreme Court ruling. Also, the detailed engineering cost of the building project is already indicated in the supplemental budget 1 that the PB earlier approved. Garcia said that what Davide did was a breach of procedure because the governor would always seek PB approval for every Capitol project. Furthermore, the building contract was awarded to WT Construction when the source of funds for the project was not clear. The building project, which Gwen called “Torre ni Davide,” is anomalous and illegal because its completion target goes beyond the gubernatorial term of Davide. Davide only has until June 30 to sit as governor, but the building project has 790 days or two years to be completed. Besides, the design of the building goes against the National Cultural Heritage Act of 2009 as it does not have the approval of the National Historical Commission of the Philippines. Cebu has no need for the Torre ni Davide, Gwen said. “Ask forgiveness from Cebuanos for insulting their feelings and intelligence,” she said. Davide, for his part, said Capitol observed the requirements under the Government Procurement Act. “We are prepared to defend the project. Of course we know them. Mao man ni sila. Hilig kaayo og broka. Kanang file file dayon og kaso, pero sige lang preparado man ta motubag ana,” Davide said. He said Capitol took out a P1.3-billion loan from DBP so that it will not have to touch Capitol funds that can be used for basic services. Davide said the proposed Cebu Resource Center is a worthy project, and that Capitol has studied it carefully.